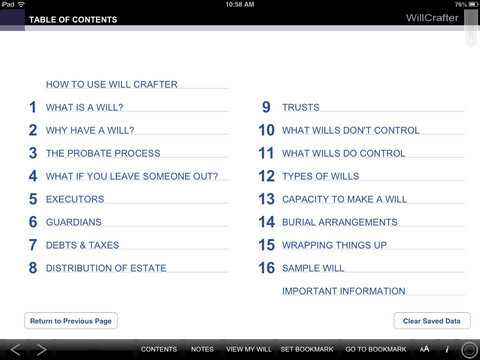 Will Crafter is an iPad app developed byBGCJ Productions Inc. Will Crafter offers two main services: a comprehensive manual on wills, plus a DIY kit for drafting a will of your own. Nobody likes to think about dying, which is probably why so many people wait until the end of their lives to take care of a will. 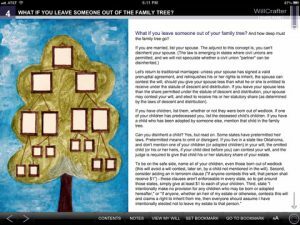 However, if you have land holdings or intellectual property of any kind, having a will completed now will ensure that your property is put in the right hands after your death. Now, Will Crafter does have some limitations. 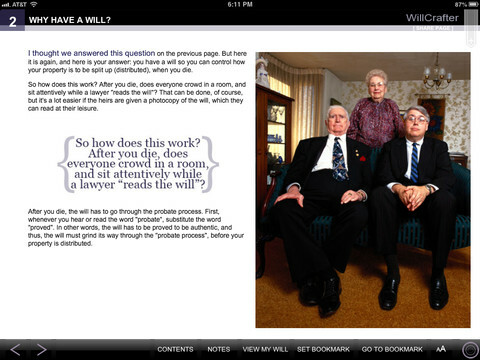 The app does not currently provide or plan to provide advice on credit sheltered trusts, health care power of attorney, special needs trusts, wills for U.S. Territories, or complicated wills. You’ll need to see an attorney to deal with those situations. In addition, you should know that the manual and DIY program has only been designed for use in the United States. U. S. territories and protectorates are not covered, but the District of Columbia is. 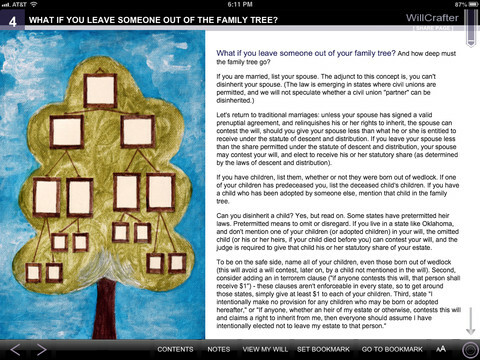 That being said, you can create a will in about an hour, which is pretty darn impressive. 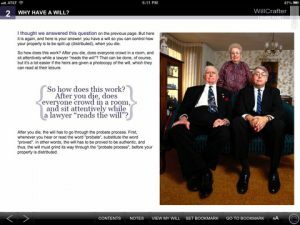 You still might want to have an attorney review the will you create, as laws regarding wills vary from state to state and country to country. That being said, Will Crafter wills have been designed to be effective as soon as they have been signed, witnessed, and (in most cases) notarized. 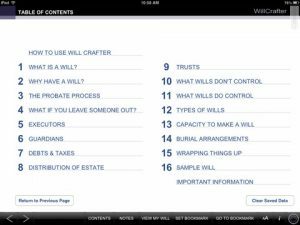 Whether you’re looking to finalize your last will and testament, or just want a bit of background information to help you get started, Will Crafter is a great resource. It’s simple to digest, packed with useful information, and a bargain at just $7.99. What attorney works that cheaply? Will Crafteris compatible with iPad. Requires iOS 5.1 or later.